On Sunday, January 17, the Nicola Valley Fish & Game Club hosted its 10th annual ice fishing derby at Mamette Lake. Like the previous year the weather was beautiful and lured over 200 people and families to the lake. Over the years this has become a traditional event for many local anglers and it attracts people from as far away as Vancouver Island and Washington State. The warm weather leading up to the derby had the organizers worried a bit about the ice conditions on the lake but measurements on the previous day confirmed a solid 18-inch thickness of the lake’s ice. As scheduled, at precisely 8 am a siren blast marked the official start of the derby which lasted until 2 pm. Anglers were prepared with augers, fishing rods and bait in anticipation of hopefully catching a fish that would score high enough for one of the many prizes that were available. Alex Mentes came in first place with a 3 lb. 2 oz. 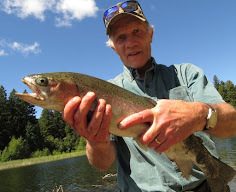 Rainbow trout, second place went to John Richter, whose trout weighed in at 2 lb. 13 oz., and Kevin Andrew took third place with a 2 lb. 11 oz. trout. That prize was won by Steve Gillingham with a 4 lb. 8 oz. Sucker Fish that left everyone else far behind him. The hidden weight prize went to Tod Bilawchuk. Despite there being no entries into the Children’s Class there was a great deal of participation by the youngest anglers and they had a fun time doing it too. And, thanks to the generosity of Merritt’s business and merchant community, and the BC Angling Ambassador Program, no child left the ice without a giveaway prize. After all the weighing and counting was over there were 21 trout on the list and 30 coarse fish, plus a few more that were released by the anglers due to small size. All in all not a bad day of fishing by any standards despite a slow start. A special thank you from the Nicola Valley Fish & Game Club goes to the Merritt Conservation Officer team that was present throughout the event and who also donated their tent for the event. Also a huge thank you goes to the Merritt Search and Rescue team for loaning the second tent and all the many volunteers that provided their personal time and effort to make this ice fishing derby the event anglers from Merritt and around the province have come to expect and look forward too. Sounds like a great time! I haven't done any ice fishing since I was a kid living up in Maine, where we used to catch trout through the ice. We were only 11 years old and couldn't afford to buy live minnows, so we'd walks around on the ice and pickup dead minnows left by previous ice anglers and use them for bait. Believe it or not, these worked great! As much fun as ice fishing would be...being from the Midwest, I would miss the sounds of the big motors humming at take off as well as the red, green and white lights in the early morhing light!!! Great Blog...I will keep reading. I just found your blog through BlogCabinAngler's blog roll. Great site! I have added you to my blog roll as well. Keep writing and I'll keep reading. Thats good everyone had a good time out there. To me those fish seem small, that because I'm us to catch 10lb+ rainbow trout in niagara river.